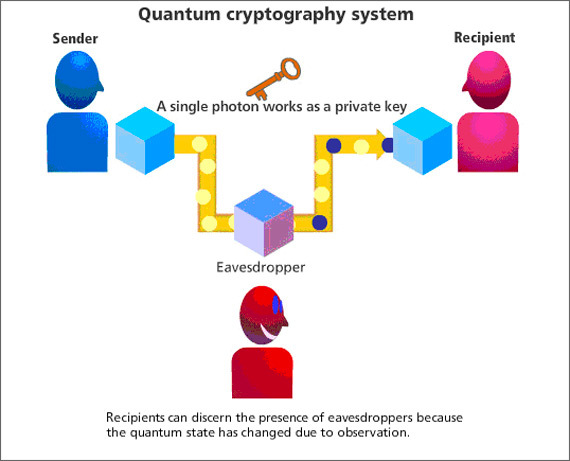 Quantum cryptography uses physics to develop a cryptosystem completely secure against being compromised without knowledge of the sender or the receiver of the messages. The word quantum itself refers to the most fundamental behavior of the smallest particles of matter and energy. Quantum cryptography uses photons to transmit a key. Once the key is transmitted, coding and encoding using the normal secret-key method can take place. But how does a photon become a key? How do you attach information to a photon’s spin? This is where binary code comes into play. Each type of a photon’s spin represents one piece of information -usually a 1 or a 0, for binary code. This code uses strings of ones and zeros to create a coherent message. For example, 11100100110 could correspond with “h-e-l-l-o”. So a binary code can be assigned to each photon, for example, a photon that has a vertical spin ( | ) can be assigned a 1. “If you build it correctly, no hacker can hack the system. The question is what it means to build it correctly”, Renato Renner, the Institute of Theoretical Physics in Zurich. But such encryption techniques have their vulnerabilities. Certain products – alled weak keys– happen to be easier to factor than others. Also, Moore’s Law continually ups the processing power of our computers. Even more importantly, mathematicians are constantly developing new algorithms that allow for easier factorization.